Personal data is the information that makes it possible to identify an inpidual. Primarily, this includes your name, date of birth, address, phone number and e-mail address, plus your IP address. Data is said to be anonymised if no connection can be established to the inpidual user. Right to object (Art. 21 EU GDPR). To exercise these rights, please contact us at: datenschutz@semikron.com. Please use the same address if you have any questions about data processing in our company. You also have the right to appeal to a data protection supervisory authority. If we process your personal data for direct advertising purposes, you have the right to object to such data processing at any time without giving reasons. This also applies to profiling insofar as it is linked to direct advertising. If you object to data processing for direct advertising purposes, we will cease processing your personal data for such purposes. You can send your objection free of charge and without using any special forms, preferably to: datenschutz@semikron.com. In cases where we process your data in order to safeguard legitimate interests, you can object to such processing at any time for reasons related to your particular situation. The same applies to profiling for such purposes. We will then cease processing your personal data unless we can provide compelling legitimate reasons for doing so which outweigh your interests, rights and freedoms, or unless the processing is used to assert, exercise or defend legal claims. The provisions of EU GDPR and all other applicable data protection provisions will be observed when your personal data is processed. Legal principles for data processing are derived primarily from Art. 6 EU GDPR. We use your data to initiate business, fulfil contractual and statutory obligations, continue the contractual relationship, offer products and services, and strengthen the customer relationship, which may also include analysis for marketing purposes and direct advertising. Your consent is also a data protection authorisation requirement. Here we inform you of the purposes of data processing and of your right to object. If consent is also related to the processing of special categories of personal data, we will explicitly indicate this when consent is given. Processing of special categories of personal data, as defined by Art. 9(1) EU GDPR, takes place only if there are legal requirements for doing so and there is no reason to assume that your legitimate interest in barring such processing should take precedence. We will pass your data to third parties only to the extent permitted by law or with the appropriate consent. Otherwise, data will not be transferred to third parties, unless we are obliged to do so by mandatory statutory provisions (transfer to external bodies such as supervisory authorities or law enforcement agencies). Within our company, we ensure that your data is accessible only to those persons who need it to fulfil contractual and statutory obligations. Depending on your business relationship with the SEMIKRON Group, staff at other business units may access your data as part of sales, product- and application management, purchase, support and marketing activities. The work of some of our technical departments is supported by service providers. This includes the provision and maintenance of our web servers, the technical implementation of our webshop and ERP system, credit card processing, goods picking and sending parcels, sending newsletters, conducting online surveys and customer satisfaction surveys, web tracking and the placement of advertisements in search engines and advertising networks. The necessary data protection agreements have been concluded with all relevant service providers. Data is transferred to third countries (outside the European Union or European Economic Area) only if necessary for the execution of the contract, or if required by law, or if you have given us your consent. The processing may be based on specific guarantees, such as official recognition that an EU equivalent level of data protection has been established (e.g. via the Privacy Shield for the USA) or compliance with officially recognised special contractual obligations (known as standard contractual clauses). We store your data as long as it is necessary for the particular processing purpose. Please note that we continue to (must) store data due to multiple retention periods. This primarily concerns retention requirements under commercial and tax law (e.g. German Commercial Code, German Tax Code, etc.). Data is routinely deleted once its purpose is fulfilled, unless there are additional retention requirements. Furthermore, we may retain data if you have given us permission to do so, or in the event of any legal disputes for which we use evidence subject to the statutory limitation periods, which may be up to 30 years, the standard limitation period being three years. We implement appropriate technical and organisational security measures to provide the data we hold with optimal protection against accidental or intentional manipulation, loss, destruction or access by unauthorised persons. With the assistance of security experts, we constantly monitor security levels and adapt them to meet new security standards. All data transfer to and from our website is encrypted. Our websites use the HTTPS transfer protocol and always utilise the latest encryption protocols. We also provide our users with transport encryption for our contact forms. Only we can decrypt this data. In addition, there is the option of using alternative methods of communication (e.g. ordinary post). Various personal data is required for the initiation, execution and termination of the contract and fulfilment of the associated contractual and statutory obligations. The same applies to the use of our webshop and the various functions this provides. The relevant details are summarised for you in the section above. In certain cases, statutory provisions necessitate the collection or provision of data. Please note that we cannot handle your enquiry or execute the underlying contract unless this data is provided. The context determines which data we process. It depends, for example, on whether you register to place an order online or submit an enquiry using our contact form. Please note that, if necessary, we also make information available separately, at an appropriate point, for specific processing situations, such as newsletter registration. For technical security reasons (in particular, to intercept any attempts to hack our web server), this data is stored in accordance with Art. 6(1) (f) EU GDPR. Anonymisation in the form of truncation of the IP address takes place within no more than seven days, hence no link is created to the user. Data exchanged between the contact form and the web server is encrypted. We use the HTTPS transfer protocol and always utilise the latest encryption protocols. The data received by the web server is then sent to us unencrypted via e-mail. There is also the option of using alternative methods of communication (e.g. ordinary post). Data exchanged between the registration form and the web server is encrypted. We use the HTTPS transfer protocol and always utilise the latest encryption protocols. Data exchanged between the newsletter registration form and the web server is encrypted. The data received by the web server is then sent to the authorised e-mail service provider encrypted. We use the HTTPS transfer protocol and always utilise the latest encryption protocols. There is a contact form on our website which can be used to contact us electronically. If you write to us using the contact form, we process the data you enter on it in order to contact you and respond to your questions and requests. In doing so, we adhere to the basic principles of data minimisation and data avoidance by requiring you to enter only the data that we need in order to respond to your enquiry. This includes the subject of the enquiry, your e-mail address and the message field itself. In addition, your IP address is processed out of technical necessity and for legal protection. All other data is voluntary and filling in those fields is optional (e.g. to obtain a more customised response). If you contact us by e-mail or by phone, we will process the personal data disclosed in the e-mail or within the call only in order to handle your enquiry. If you do not use the forms provided for contacting us, no additional data is collected. You can subscribe to a free newsletter via our website. Your name and the e-mail address you provided when you registered for the newsletter are used when the personalised newsletter is sent out. In doing so, we adhere to the basic principles of data minimisation and data avoidance, as the only mandatory fields are the e-mail address and your preferred newsletter language. Your IP address is processed out of technical necessity and for legal protection when you register for the newsletter. By registering for our newsletter, you agree that we may conduct analysis in order to gauge how often the newsletter is opened and which links readers click. We use the analysis to make ongoing improvements to our newsletter and to make it relevant to you. You can, of course, end the subscription at any time by using the unsubscribe option provided in the newsletter, thus withdrawing your consent. We only process the data you have entered in the order form in order to perform or process the contractual relationship unless you have consented to further use of your data. We adhere to the basic principles of data minimisation and data avoidance by only asking you to enter the data that we need in order to execute the contract and or fulfil our contractual obligations (i.e. your name, company invoice address, e-mail address, telephone number and the payment data required for each selected payment type ), or the data that we are obliged to collect by law (e.g. VAT identification number). In addition, your IP address is processed out of technical necessity and for legal protection. Without this data, we will unfortunately have to refuse conclusion of the contract since we cannot implement it, or we will have to terminate an existing contract, where applicable. Obviously, you can also provide us with more data if you wish. On our website, we offer users the opportunity to register by entering their personal data. The advantage of this is that you can use the quotation tool and view your order history in particular, and that the data you have entered is saved for the order form. This means that when you place your next order, you will not need to reenter this data. Registration is therefore required either to fulfil a contract (via our online shop) with you or to perform precontractual measures. In doing so, we adhere to the basic principles of data minimisation and data avoidance, as only the data required for registration is marked as a mandatory field using an asterisk (*). This includes your e-mail address and password, whereby you must confirm the password by reentering it. For orders placed in our online shop, we also need your invoice address details (first name, surname, address) for the delivery. If the delivery address differs from the invoice address, the above details for the delivery address must also be entered. By registering on our website, the user's IP address, the date as well as the time of registration are saved (technical background data). By clicking the "Register now" button, you are giving your consent to your data being processed. Please note: The password that you enter is saved in an encrypted format. Our company's employees cannot read this password. They cannot therefore provide you with any information if you forget your password. In such an event, use the "Forgotten password" function, whereby you will receive an e-mail with a new automatically generated password. No employee is entitled to request your password over the phone or in writing. Please therefore never give out your password if you are asked to do so in this way. At the end of the registration process, we save your data in order to use the protected customer area. As soon as you log into our website using your e-mail address as a user name and your password, this data is made available for the actions you perform on our website (e.g. for orders in our online shop). Any orders placed can be tracked in the order history. You can enter any changes to your invoice or delivery address here. Registered persons can make changes/corrections to the invoice or delivery addresses in the order history themselves. Our customer service team is also happy to make any changes/corrections for you if you contact them. Obviously, you can also choose to have the registration cancelled or your customer account closed or deleted after contacting us. in order to fulfil your order and process the payment. In addition, your IP address is processed out of technical necessity and for legal protection. We adhere to the basic principles of data minimisation and data avoidance by requiring you to enter only the data that we need in order to process the payment and thus to process the contract, or the data which we are obliged to collect by law. Without this data, we will unfortunately have to refuse conclusion of the contract since we cannot implement it. Our payment system uses SSL encryption for the secure transmission of your data. Note on payment on account: If you select the on account payment type in our online shop, we will perform a credit assessment purely based on your company data. Note on credit card payment: We expressly point out that the credit card data required for payment is not collected and assessed by SEMIKRON, but by a partner company called computop. 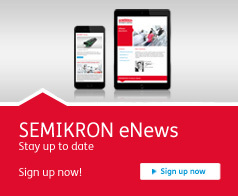 The SEMIKRON Group is keen to maintain its customer relationship with you and to send you information and offers regarding our products and services. To this end, we process your data so that we can provide you with appropriate information and offers via e-mail. If you prefer not to receive these, you can object to your personal data being used for direct advertising purposes at any time. This also applies to profiling insofar as it is linked to direct advertising. If you object, we will no longer process your data for this purpose. We do not use any automated process to make a decision. Cookies are used at several points on our websites. We use them to make our service more user-friendly, effective and secure. Cookies are small text files which are stored on your computer and which are saved in your browser (locally on your hard drive). By using these cookies, we can analyse how users utilise our websites. This helps us create website content that meets our visitors' needs. Cookies also give us the opportunity of gauging the effectiveness of a particular advertisement and determining where to place it, for example, depending on which topics interest the user. Most of the cookies we use are session cookies. They are deleted automatically after your visit. Permanent cookies are automatically deleted from your computer at the end of their validity period (usually six months) or when you delete them yourself before the validity period expires. Most web browsers accept cookies automatically. However, you can generally also change your browser settings if you would rather not send the information. Please note that you may not be able to use some functions on our website in full if you disable cookies. usage profiles are not combined with data concerning the bearer of the pseudonym without the express consent of the visitor. In particular, IP addresses are rendered non-identifiable immediately after they are received so that usage profiles cannot be assigned to IP addresses. User behaviour is analysed based on Art. 6(1) (f) GDPR. The owner of the website has a legitimate interest in the anonymised analysis of user behaviour in order to optimise both their website and their advertising. Visitors to this website can object to this data collection and storage here at any time with future effect. This objection only applies to the device and the web browser on which it has been set; please repeat the process on all devices where applicable. If you delete the opt-out cookie, requests will be transmitted to econda again. Our website also contains (clearly identifiable) links to the websites of other companies. We have no control over the content of other providers' websites to which we may provide links. Hence, we can neither vouch for nor assume liability for such content. The provider or operator of these websites is responsible for the content of the linked pages. The linked sites were checked for possible infringements of the law and identifiable infringements of rights at the time the links were set up. No illegal content was identified at the time the links were set up. However, continuous monitoring of the content on linked pages is not deemed reasonable without specific grounds to suspect a legal violation. The links will be removed immediately as soon as we become aware of any legal violations.